All Ambler homes currently listed for sale in Ambler as of 04/21/2019 are shown below. You can change the search criteria at any time by pressing the 'Change Search' button below. If you have any questions or you would like more information about any Ambler homes for sale or other Ambler real estate, please contact us and one of our knowledgeable Ambler REALTORS® would be pleased to assist you. 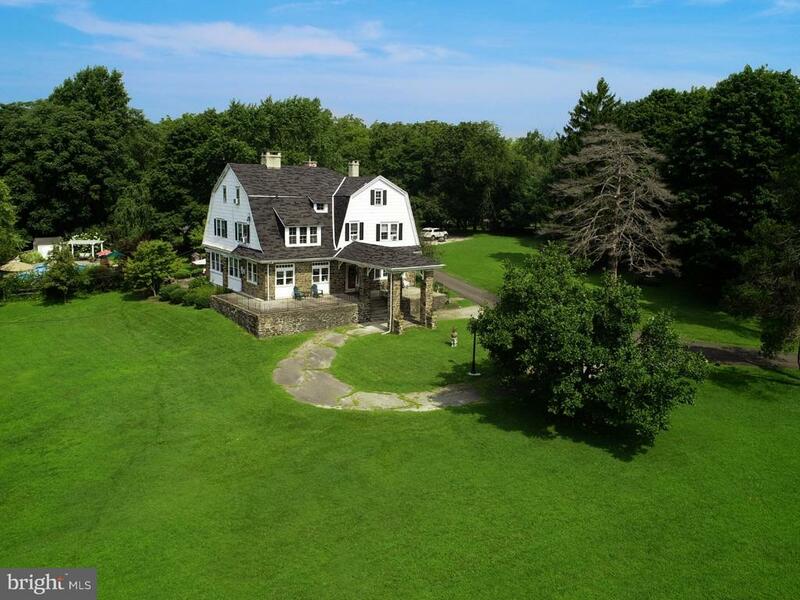 "Introducing Dawesfield, an exceptional 22-acre property in an extraordinary Whitpain Township location, dating back to 1736, surrounded by Wissahickon Watershed permanently preserved open space, featuring two 3-Story Stone Colonials, 3 Barns, one dating to 1796, multiple detached Garages, Sheds, Greenhouse, Spring House and Guest House, and including a 3-hole Golf Course and Swimming Pool. Horse lovers will be thrilled with the connection to the surrounding trails. Car lovers will be enthralled with the capacity for car collections in the multiple barns. Horticulturists will be delighted with the age and multitude of specimen trees, shrubs and continually blooming perennials in the magnificent gardens with surrounding stone walls. Historians will be fascinated by the stories detailing the use of one of 2 stone colonials as George Washington's headquarters in 1777 during the Revolutionary War, including the encampment of over 10,000 troops on the grounds and adjacent properties. One house is 5829 sq ft with 7 bedrooms, and the other is 5129, with 5 bedrooms. The 1 Bedroom Guest House is an ideal location for a Home Office. 1000s of daffodils blanket the gardens; specimen magnolias provide brilliant blooms; ancient trees grace the expansive grounds. The panoramic views are magnificent, and the possibilities are endless at this enchanting location. Many historical items are included with the purchase, including the bed that George Washington slept in while the property was his headquarters, along with various framed historical documents. Also included will be many pieces of equipment including a golf cart, tractor and mowers. Sale includes 4 separate parcels. Separate parcels available for purchase. Call for more details." "Camp Woods Estate is a one-of-a-kind property with a stunning home that spans over 14,000SF of meticulously appointed luxurious living and is situated on almost 8 acres of gorgeously landscaped grounds. The estate is named after the adjacent historically significant Camp Woods Land Preserve consisting of 36 acres, which was home to General George Washington and his troops in the fall of 1777. Originally built in 1913 as a wedding gift for a young couple, Camp Woods has been re-envisioned and expanded upon by architect Rene Hoffman and custom builder, Great Estates Inc. The home melds the best of modern living and old world charm with state-of-the-art systems and top of the line finishes while keeping the integrity of the many historical details. Arrive at the gated entrance flanked by stone columns and meander down a lovely tree-lined drive to the handsome facade with hand-cut quarried stone and a slate roof. A circular driveway leads to the portico entrance of the original house. Upon entering, you will be welcomed by an open, light-filled entry hall that flows seamlessly between elegant formal entertaining spaces and more intimate family rooms. The home is rich in details with extensive millwork and cabinetry, white oak floors, gorgeous stone finishes and custom high efficiency windows that replicate the original windows from 1913. The spacious eat-in chef's kitchen is complete with Calacatta Gold island and countertops, extensive cabinetry, butler's pantry and professional grade appliances. The home also boasts a wine cellar, movie theater, gym, 5 gas fireplaces, elevator, two laundry rooms, custom dog grooming area and heated four-car garage. The advanced systems include 28 zones of radiant heat and 13 zones of chilled water cooling system and a state-of-the-art security system. There is a wonderful synergy between the indoor and outdoor spaces. Outdoor entertaining areas include an expansive 5,000SF blue-stone terrace with salt-water gunite pool, 2 outdoor fir"
"Sitting atop the higest point of Whitpain Township, this magnificent estate sits on six plus private acres. Every inch of this luxurious home will grab you. From the soaring ceilings, stunning woodwork, floor to ceiling windows & original marble fireplaces, this home is simply spectacular. While it's hard to deny a sense of grandeur upon entering the foyer, the attention to detail is instantly apparent. This home is as impressive as it is inviting from the start. The expansive living room with marble fireplace opens to a formal dining room through impressive pocket doors and creates a wonderful flow for entertaining. The kitchen is a beautiful blend of old & new. It's spacious & prepped for chefs of all levels while also offering a warm & casual ambiance essential to a great kitchen. A well-appointed butler's pantry connects the kitchen to a pleasant, informal living room. From there, an open office space leads to a sun-lit orangerie that can serve as an art studio, reading room, writing space or simply a place from which to gaze at the in-ground pool & spa. The 1st floor also features a music room, parlor or library?possibilities abound, a distinctive, gleaming black walnut banister beckons up a plush staircase to the 2nd floor. The 1st 2 expansive bedrooms feature high ceilings & large windows with deep sills that evoke luxury while marble fireplaces & red pine floors are charming reminders of the home's history. The master is light & airy with its own fireplace & abundant walk-in closet. The master bath is a sight to behold, with a steam shower, radiant floor heat, water closet & claw-foot tub. And,of course, a fireplace. A beautifully tiled breezeway leads from the original home to the annex, designed by renowned architect Rene Hoffman. From wood beaming on the ceiling to authentic stone-and-stick-work on the exterior, no detail was taken for granted in this stunning space added 10 years ago. It features a 3-car garage & an upstairs suite with a light-filled"
"Tasteful, Timeless, and Elegant best describes this Custom Built Sweeney Home. It sits in The Heart of ~Gwynedd Valley~ and is nestled on a very private 1.88 acre lot. It features professional landscaping, beautiful mature shade trees, colorful crab apple orchard and extensive hardscaping.As you approach the home up the long private driveway, you~ll immediately appreciate the striking architecture with Classic colonial designs and only the best materials and workmanship available. The home underwent a major renovation in 2004. Renowned Bucks County architect Richard A. Yarnall designed and implemented plans that included new Hardscape, new kitchen design, master bedroom suite and garage addition. This renovation added to the already exquisite home. The exterior of the home features an antique brick fa~ade with raked joints, cedar siding, a newer simulated slate roof with recessed copper gutters and custom dental moldings. All topped off by professionally designed and maintained Landscaping package and extensive hardscaping for the walkways and patios The first floor features a grand two story entrance foyer with beautiful hardwood floors, turned staircase and balcony,warm natural light, wainscoting and crown molding touched off by classic bamboo grass wallpaper. The perfectly designed floor plan creates areas that are bright and open as well as others that are private for your time of quiet reflection, work or reading your favorite author. This all creates a home perfectly suited for everyday living as well as formal entertaining. There is a fantastic remodeled kitchen featuring beautiful easy close Neff Kitchen Cabinets, double wall ovens, built in Subzero refrigerator and freezer and Bosch dishwasher, granite countertops, tile backsplash, spacious center island, workspace/breakfast bar, hardwood floors and a bright and cheery breakfast nook complete with a wood stove to take the chill off on those frosty days. Pella sliding glass doors lead to a large flagstone "
"Exquisite 5 Bedroom, 6 Bath Custom Manor Home, formerly the model home for Horsham's highly desirable enclave of Greystone, once awarded the Pinnacle single family home of the year, w/over 7300 sq ft including the Walkout Finished Lower Level w/In-Law Suite, Movie Theater & Gym, w/fabulous curb appeal & stunning amenities & situated on a gorgeous 1.07-acre lot. Superior architectural details encompass every inch of this stunning home, from the hardwood floors to the high baseboards, arched & cased openings, fluted columns, coffered ceilings, shadow boxes, wainscoting, crown moldings & custom built-ins. Twin 8' mahogany French doors open to the front-to-back foyer offering an immediate view of the rear grounds. The Living Room features the 1st of 2 fireplaces & the Dining Room w/8' French doors opens to the Butler's Pantry w/cherry cabinets, granite counters & bar sink. The Gourmet Kitchen w/wide-plank, random-width hardwood floor features a Charles Wieler Kitchen w/center island, granite counters & top-of-the line appliances including a Wolf 48 range. The Kitchen is open to the sun-filled Breakfast Room w/French doors providing access to a covered Deck. The spectacular 2-story Family Room offers a coffered ceiling, a wall of windows allowing streaming sunlight thru-out, the 2nd FP w/floor-to-ceiling stone & brick surround, custom built-ins w/wet bar & TV included. The Library includes paneled oak walls & built-ins plus another gorgeous coffered ceiling. 2 sets of stairs provide access to the 2nd floor, one leading to a gorgeous Loft w/custom built-ins. The spa-worthy Master Suite features a Sitting Room opening to the Bedroom plus a flat screen TV, & 2 large prof organized closets. The stunning Master Bath offers cherry cabinetry, marble counters, Jacuzzi, & exciting spa shower w/frameless glass door. 4 additional bedrooms w/1 en-suite bath & 1 Jack & Jill, plus a Laundry Room, & unfinished possible 6th bedroom complete the 2nd floor. Enjoy the amazing Walkout Lowe"
"CARRIAGE RUN MODEL HOME NOW OPEN!!! !This Community features 11 Homes that can be customized. THE Chateau is one of Oxford Land Development's Classic floor plans, now available in the Premier Single Family Home Community of CARRIAGE RUN located in Horsham Township. As you enter this magnificent home you will step into the Grand Foyer with a graceful turned staircase and flanked by a Formal Living room and Large Formal Dining room. The Dining room will feature an inverted tray ceiling, and is serviced by a convenient Butlers Pantry. The spacious Gourmet Kitchen will feature a beautiful choice of cabinetry with a center island and gleaming granite counter tops. A large walk in pantry keeps the busy chef organized. The triple window overlooking the rear of the property will allow natural light into the room. Creating that wonderful Open feeling is the lovely Breakfast room with a walk in bay window and atrium door leading outside. The crowd friendly Family room is a wonderful space for entertaining and will feature a Fireplace with Gas logs. Rounding out the first floor is a large laundry room with utility sink and door to the rear of the property, an au pair, guest quarters or in-law suite with a full bath and the beautiful rear staircase for additional access to the upstairs bedrooms. The Master bedroom is a marvelous Retreat. Featuring a tray ceiling, cozy sitting room and a spacious bath with separate vanities, oversized shower, and a large soaking tub, this is the place to get away from the world. 3 other ample sized bedrooms with great closet space complete the second floor. All of the homes at Carriage Run include Public Water, Public Sewer and Natural Gas heat. Lots range from over 1 acre to 2 acres.Only 11 Homes will encompass this lovely neighborhood. 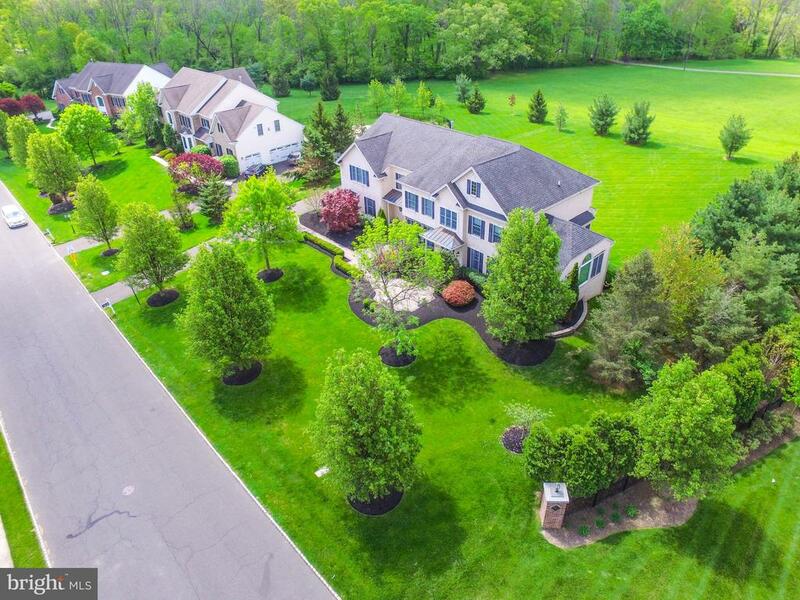 The Community features a Belgium block lined Cul-de sac with sidewalks and carriage style street lighting and offers access to the Award Winning Blue Ribbon Horsham School District, Township Parks and walking"
"Elegant Estate Home located on a quiet cul-de sac. This 3 Story Colonial has outstanding architectural details. The EP Henry walkway leads you to a meticulously maintained custom home. Entering into the grand foyer, you will be astounded with the open design and size of this luxury home. There is a beautiful front to back foyer with many details and glass doors in the rear. The foyer opens into a Formal Living Room & Dining Room with arched openings, crown moldings, accented with striking millwork. The Butler's Pantry has granite counters, cherry cabinets with under counter lighting and sink. The gourmet Kitchen has plenty of cherry cabinets with under counter lighting, granite counters with an oversized island, Subzero refrigerator & freezer, Dacor double oven, Dacor warming drawer and 6 burner Thermador gas cooktop. The stunning Breakfast Room is to the side with planation shutters, a cathedral ceiling and has access to the backyard EP Henry patio. The large Family Room has a gas fireplace, plenty of windows, crown moldings and is a great place to entertain. The spacious Study is tucked on the far side of the foyer offering views of the backyard. There are formal and informal Powder Rooms on the first floor. The tiled mud room has built in cubicles, a large closet, enough room for two refrigerators and close proximity to a 2nd back staircase. The 2nd floor has a Grand Master Bedroom Suite with arched entry, crown moldings, a sitting area, custom makeup area with granite counter and 2 California Closets. The Master Bath has two granite vanities, a shower and a Jacuzzi to relax in. There are 4 other roomy Bedrooms, 3 of which have California closets. The tiled Laundry Room has numerous cabinets and a large counter. Convenient steps to the floored attic allow easy access for storage or can be finished for additional living space. The large finished Basement has a Powder Room, walk up Bilco doors and a vast amount of storage space. 3 Car garage, Custom Archways, Bu"
"MODEL HOME NOW OPEN THE Manor is one of Oxford Land Development's Classic floor plans, now available in the Premier Single Family Home Community of CARRIAGE RUN located in Horsham Township. This Community will feature Only 11 custom Homes. As you enter this magnificent Model home you will step into the Grand Foyer with a graceful turned staircase and flanked by a Formal Living room and Large Formal Dining room. The Dining room will feature an inverted tray ceiling, and is serviced by a convenient Butlers Pantry. The spacious Gourmet Kitchen will feature a beautiful choice of cabinetry with a center island and gleaming granite counter tops. A large walk in pantry keeps the busy chef organized. The triple window overlooking the rear of the property will allow natural light into the room. Creating that wonderful Open feeling is the lovely Breakfast room with a walk in bay window and atrium door leading outside. The crowd friendly Family room is a wonderful space for entertaining and will feature a Fireplace with Gas logs. Rounding out the first floor is a large laundry room with utility sink and door to the rear of the property, an au pair, guest quarters or in-law suite with a full bath and the beautiful rear staircase for additional access to the upstairs bedrooms. The Master bedroom is a marvelous Retreat. Featuring a tray ceiling, cozy sitting room and a spacious bath with separate vanities, oversized shower, and a large soaking tub, this is the place to get away from the world. 3 other ample sized bedrooms with great closet space complete the second floor. All of the homes at Carriage Run include Public Water, Public Sewer and Natural Gas heat. Lots range from over 1 acre to 2 acres. The Community features a Belgium block lined Cul-de sac with sidewalks and carriage style street lighting and offers access to the Award Winning Blue Ribbon Horsham School District, Township Parks and walking trails and Great Shopping. Easy access to major highways yet hidden aw"
"MODEL NOW OPEN The Excitement is Building and the Wait is over. 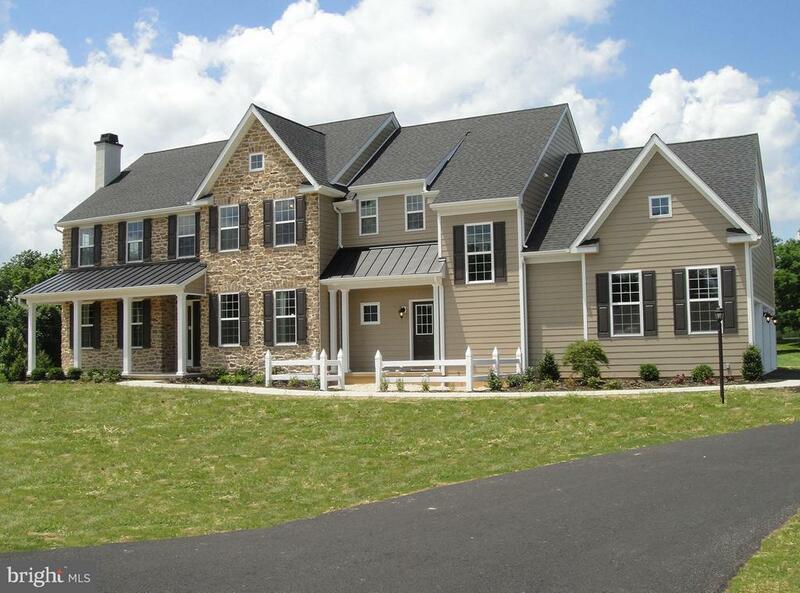 Construction of the Newest Custom Home Development in Horsham Township is Complete. Oxford Land Development is proud to announce their latest New Home Community CARRIAGE RUN! With ONLY 11 Homes, each over 1+ acre of land and surrounded by large trees this lovely cul de sac community offers the best of all worlds. Most homes will feature 4 to 5 Bedrooms, 3 1/2 + Baths, Full Basements and 3 Car garages. NEW FIRST FLOOR MASTER PLAN NOW AVAILABLE. Offering generous allowances and selections to personalize your New home. Top Quality Construction with a Hands On attitude will make building Your New Home a Great Experience. A quiet and secluded site yet close to the PA Turnpike, Routes 611, 309 and the Blue Route(476), this Community is in the highly Awarded Hatboro-Horsham School District and within walking distance to several Parks and Recreation centers. A wide choice of shopping and dining surrounds this Upscale New community. MODEL HOME Open Saturday and Sunday from 12 to 4 pm or Anytime by Appointment PHOTOS ARE OF THE MANOR MODEL HOME"
"This stunning French manor estate home is located in the prestigious community of Greystone and is situated on a premier lot that overlooks the tranquil community pond and fountain. 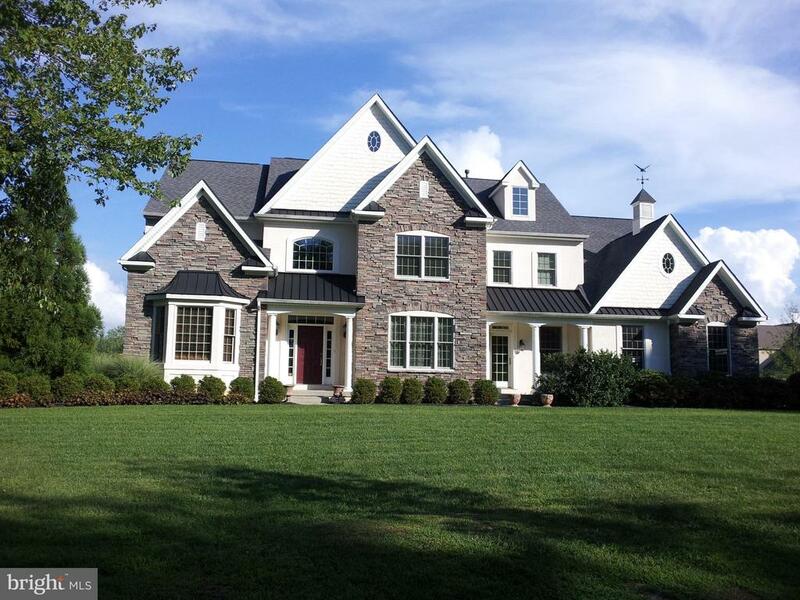 This custom built home offers countless upgrades and quality finishes throughout. When arriving at the home you are welcomed by the amazing curb appeal with lovely English garden walls, landscaping and lanterns. Enter the home through double front doors with lead glass details into a gorgeous foyer with custom marble floors with onyx accents. Upon entering the foyer, you will immediately notice the gracious arched doorways, custom millwork, plantation shutters, custom window treatments and hardwood floors beyond the foyer. Flanking the foyer you will find an elegant living room with a custom limestone gas fireplace and a formal dining room with a bay window and extensive millwork and mouldings. Continue to the substantial, gourmet kitchen that boasts a granite island and countertops, a tumbled limestone backsplash, voluminous cherry cabinetry with under lighting, a 6-burner Wolf range with hood vent and double oven, SubZero refrigerator, a double sink and a secondary prep sink. There is a lovely breakfast room with a tray ceiling and French doors that lead to a Trex deck with copper accents, overlooking the expansive backyard. This areas is perfect for outdoor entertaining and relaxation. Also located on the main level, a media room with a built-in entertainment system, two powder rooms, a spacious laundry room and cubby area for the little ones and four-legged family members. Interior access to the 3-car garage! There is a built-in sound system throughout many rooms on the first floor. The open flow of the kitchen area into the family room is perfect for today~s living. The dramatic two-story family room boats a custom limestone gas fireplace and ornate millwork, floor to ceiling windows with planation shutters and gorgeous window treatments, amazing natural light and a built-"
"The Excitement is Building and the Wait is over.Our Model Home is Open Oxford Land Development is proud to announce their latest New Home Community CARRIAGE RUN! With Only 11 Homes,each over 1+ acre of land and surrounded by large trees this lovely cul de sac Community offers the best of all worlds. Most homes will feature 4 to 5 Bedrooms, 3 1/2 + Baths, Full Basements and 3 Car garages. NEW FIRST FLOOR MASTER PLAN NOW AVAILABLE. Offering generous allowances and selections to personalize your New home. Top Quality Construction with a Hands On attitude will make building Your New Home a Great Experience. A quiet and secluded site yet close to the PA Turnpike, Routes 611, 309 and the Blue Route(476), this Community is in the highly Awarded Hatboro-Horsham School District and within walking distance to several Parks and Recreation centers. A wide choice of shopping and dining surrounds this Upscale New community.MODEL HOME Pricing Starts at 1,109,900 Open Saturday and Sunday from 12 to 4 pm or Anytime by Appointment BUILDER OFFERING A 30,000. INCENTIVE BONUS ASK FOR DETAILS"
"Pride of ownership is evident in the Custom Paone built home with almost 5,000 square feet of living space. Cul-de-sac location makes this well-appointed home one of the best locations in Fairway Estates. This elegant home has three finished levels. This impeccably maintained estate will please any buyer. Exquisite gardens and landscaping surround the luxurious EP Henry four paved tiered patios with custom outside lighting. Two areas of this magnificent piazza have a rooftop, pergola and built-in fireplace. Wonderful area for outside entertaining. All three floors of the fantastic estate have no expense spared ~ Custom Blinds, Plantation Shutters, Elegant/Custom detailed molding, Recessed Lighting, Abundance of custom windows with spectacular views and 2 story entry foyer with beautiful hardwood flooring, turned staircase and back staircase. First Floor offers an elegant formal living room with gas fireplace. Large Dining Area with wonderful natural light and beautiful flooring. Gigantic Gourmet Kitchen with an abundance of Custom Cabinets, 2 walk-in custom pantries, built-ins, tiled backsplash, sleek Stainless Steel appliances, Double oven, built in microwave, spacious center island with custom cabinets, bookcase and entertainment sink. Large breakfast space that is flooded with natural light, second staircase and sliding glass doors that lead to the beautiful patios. Adjacent to the Gourmet Kitchen is a sitting area with wet bar that leads to a magnificent Great Room with a Gas Fireplace, Wainscoting and French Doors that leads to another section of the patios. Laundry Room, 2 half baths, Mud Room and 3 car garage entrance with custom shelving completes the first floor. Wonderful Master Suite with his/hers walk-in-closets, dressing area and Master Bathroom with new custom cabinets, Quartz countertops, Frameless Shower with seating and Freestanding Soaking Bathtub with separate Powder Room. Meander down the hallway with view of foyer, 4 large bedroom"
"The Excitement is Building and the Wait is over!!! Or Manor Model Home in the Newest Custom Home Development in Horsham Township is OPEN!! Several Floor Plans to choose from with Pricing Starting at 1,109,900 Oxford Land Development is proud to announce their latest New Home Community CARRIAGE RUN! With Only 11 Homes available, each over 1 acre of land and surrounded by large trees this lovely cul de sac community offers the best of all worlds. Most homes will feature 4 to 5 Bedrooms, 3 1/2 Baths, Full Basements and 3 Car garages. NEW FIRST FLOOR MASTER PLAN NOW AVAILABLE. Offering generous allowances and selections to personalize your New home. Top Quality Construction with a Hands On attitude will make building Your New Home a Great Experience. A quiet and secluded site yet close to the PA Turnpike, Routes 611, 309 and the Blue Route(476), this Community is in the highly Awarded Hatboro-Horsham School District and within walking distance to several Parks and Recreation centers. A wide choice of shopping and dining surrounds this Upscale New community. MODEL HOME Open Saturday and Sunday from 12 to 4 pm or Anytime by Appointment BUILDER OFFERING a 30,000 INCENTIVE BONUS ASK FOR DETAILS"
"Sitting on a large piece of serene property with a street name that fits it's past 1030 Farm Lane and 1018 Farm Lane are waiting to be discovered by someone who enjoys old world craftsmanship, privacy and inside the elegance of 9' ceilings, original doors with intact hardware, casing with era moldings 9 inch baseboards. Random plank flooring on 2nd & 3rd floors, downstairs has 1 1.2 inch tonge and groove oak flooring. Rooms that have been updated with Tin Ceilings. All separate offices for private work spaces. Built in 1890 grounds have original outbuildings, garden islands first generation 90' tall red oaks. While enjoying your morning breakfast you will enjoy a scenic view of St. Mary's lake. Come see this undiscovered, undeveloped piece of history." 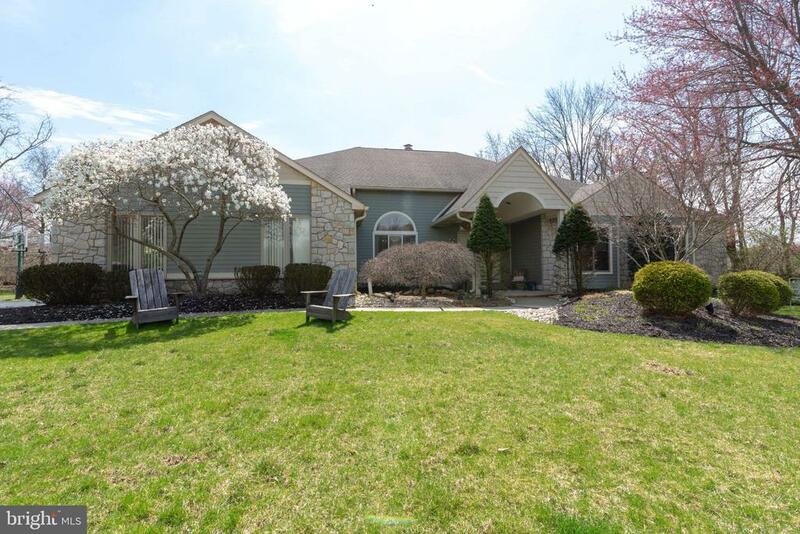 "A remarkable home located within the Upper Dublin Township and a 6 car detached garage. This French Ranch style home offers a flexible floor plan. Main level office could be converted into a bedroom or modified to create an additional owners suite. Lower level with outside ground entrance, fireplace finished space, unfinished storage space, massage room, cedar closet, filing room and full bath. Upper level with loft, full bath and two additional bedrooms. Wonderful attention to details with many upgrades throughout. Enjoy the elevated flagstone patio overlooking the lush greenery and park like setting. Slate and field stone walkways, covered patio for outdoor entertainment and hot tub enjoyment. Outdoor shower and vegetable garden. Three masonry fireplaces: great room, lower level and kitchen. New kitchen design invites your guest to join you while preparing the goodies or perhaps join in the activity. Formal setting in dining room overlooking the landscape. Natural light in great room, laundry on 1st floor with ground level entrance. Luxury Bathrooms. Circular driveway in the front with a branch leading to the six car garage. Minutes to the train and Downtown Ambler with access to all major highways and shopping. The square footage of 2546 is 1st and 2nd floor only, there is approximately 1000 square footage in the finished area of the basement. Owner has installed a top of the line/state of the art Water Purification System to protect the integrity of the water." "MAJOR PRICE REDUCTION!! !Tucked away at the picturesque end of a Cul de sac you'll find 529 Sussex Court. During the build of the owners Dream Home,a relocation occurred. A rare opportunity has presented itself for the lucky shopper. This Harrison Model is customized and expanded. The first floor Master open floor plan has all the touches your discriminating clients will want. The warm espresso floors spanning all the common area of the first floor are engineered elegance. Upon entering you are flanked by the open dining room complete with columns and wainscoting and a study with glass panel doors. The very useful Butlers pantry with glass cabinet doors will introduce you to the level of gourmet selections you'll find in the kitchen. Quartz counters, complementing dual cabinet choices, Kitchen Aide appliances all housed under an 18'vaulted ceiling. The incredible Great Room with sun filled windows and an elegant fireplace has endless furnishing options. Find your way to the Master Suite and first floor living becomes magical. The spacious bedroom has large closets and a fabulous en suite bath. Top of the line tile, quartz countertops clear glass shower and modern free standing tub. Stroll up the open tread staircase to find a wonderful loft with the three additional bedrooms and additional baths. All with lovely finishes and quartz counters. Take the open tread staircase to the lower level. You will find the 20x14 media room and a 40x20 space with a full bath and fireplace. This level also has a large finished closet as well as a substantial unfinished storage area. Excellent location for commuting and conveniences. Blue Ribbon Schools." 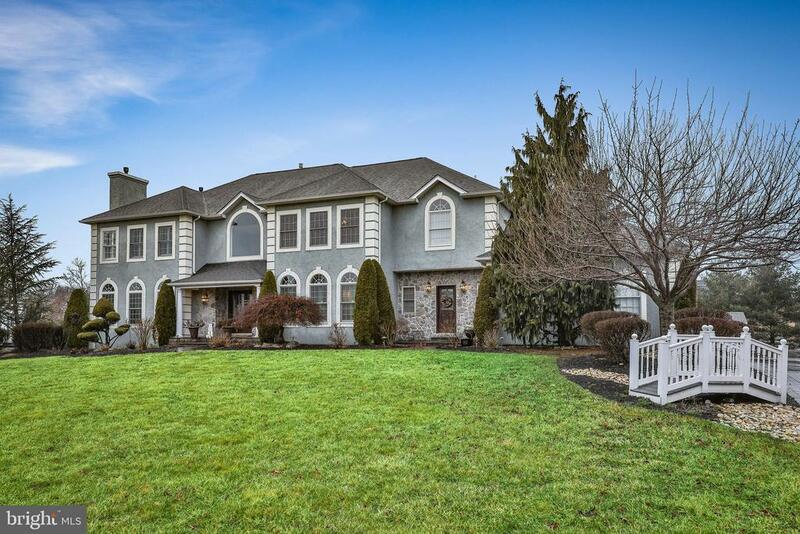 "Spectacular High Gate Colonial, Unique Very Open Floor Plan with Every Upgrade Imaginable, 7069 SF of Living Space and Situated On over 1.2 Acres, Very Private! Spared No Expense When Building This Home; This Home Has Approximately 2,500 More SF Than The Other High Gate Homes and No Other Home Can Compare to the Features and Upgrades Of This Home!! It is Truly a One-Of-a-Kind Horsham Colonial; Great News, Taxes Were Appealed and Reduced to the Current Amount, See Downloads for Letter from Township; Professional Landscaping Along with a Pristine Stamped Concrete Walkway and Courtyard Welcomes You To This Home; Highlighted Features For This Bright & Sunny Home are Gleaming Hardwood Floors, Wainscoting & Double Wide Crown Molding, Additional Windows Spaced Throughout Home, Recessed Lighting, Surround Sound Throughout Home, Gourmet Kitchen & Breakfast Room, Conservatory Addition, Oversized Master Suite, Princess Suite with Private Bath, First Floor Office, 3 Car Garage Freshly Painted, an Amazing Finished Basement and More; Enter Into a 2 Story Grand Foyer with Open Views to Living and Dining Rm and a Decorative Spiral Staircase; Conservatory w/Tons of Floor to Ceiling Windows; French Doors Leads You to Private Office w/Tons of Windows; Beautiful Kitchen w/Granite Counters, Pendant Lighting Over Island, Walkin Pantry, Upgraded Custom Cabinets, Tile Backsplash, Double Oven, Butler Pantry, Glass Cabinets & Breakfast Bar Seats Up to 4 People; Breakfast Room Addition with Vaulted Ceiling, Full Wall of Windows with Palladium Frame, Sliders to Deck, Desk Area and Tons More Cabinets Finish This Room; Family Rm w/Stone Fireplace, Skylights and Vaulted Ceiling Leads to Overlook From the Upstairs Landing; Master Bedroom Suite with Double Door Entry, Sitting Room, Tray Ceiling and His and Her Large WalkIn Closets; Master Bath with Tile Floor, Walls, Clear Glass Shower, Tons of Cabinets and Windows; Finished Walkout Basement From Sliders with Tile and Carpet on Floors, Tons of Wind"
"What people are saying~ I love the two sided fireplace between the kitchen and family room! It's the perfect space to entertain!... The stair going up to the attic is a wonderful idea! It's a great place for an additional bedroom.... The kitchen is large and welcoming. It's comparable to larger homes we've seen.... I love the backyard! So quiet and private. I feel like I'm on vacation!.... Located in Maplewood Estates, there's no question why this is one of the most desirable communities in Horsham Township.... Nestled on a quiet street and flanked by woodlands, this custom home was designed by one of the region's top architects. Its design was never duplicated and it truly demonstrates how great design is timeless. The homes transitional styling was inspired by historical architecture and responds to the needs of a modern lifestyle.... The homes open floor plan flows seamlessly from one space to another and makes efficient use of its space. A two-sided, stone fireplace with barrel vaults is shared between the kitchen and family room areas. It's a major focal point on the first floor and establishes the, Heart of the Home. Volume ceilings and a generous amount of windows along the rear of the home allow the outdoors to visually permeate the indoor space, while keeping the area open and airy.... Each of the second floor bedrooms has large closets and private or semi-private baths. The owner's suite boasts a tray ceiling and fireplace adjacent to the soaking tub. A full stair from the basement to the attic enables the home to grow easily with a family's needs. The unfinished attic has enough area to add an additional bedroom suite, private bath and living area or, anything else that compliments the owner's lifestyle.... Chirping frogs, the sound of two waterfalls and dappled light from the adjacent birch trees awaits you in the backyard oasis. A professionally landscaped garden, pond and pergola compliment this park-like setting. A victory garden has also been establi"
"Gracious stone-front center-hall Colonial on a beautiful 2-acre setting in Horsham's prestigious Valley View Estates. Step into this beautiful home and immediately you will be impressed with the spacious open floor plan that is perfect for entertaining or just a casual family retreat. Attention to detail is displayed in the entire home such as hardwood floors and plantation shutters throughout the entire main floor. The grand staircase greets you upon entering and is flanked by the custom wood-trimmed Living Room and Dining Room on either side. The front of the Foyer has two coat closets and a large picture window allowing sunlight to enter and provide a bright entrance. The two-story Family Room features a natural gas fireplace surrounded by windows which overlook the lush rear landscaping and has access to the patio and back yard. Glass French doors connect to a private office as well as connecting to the spacious Breakfast Area and Kitchen. The Kitchen features granite counters with solid oak cabinets and a triple sliding door to the luxurious rear patio and pool. Enjoy the convenience of a back staircase that connects the main and upper levels. A separate Laundry Room also exits to both the rear patio and to the oversized three-car attached side garage. The upper level features an enormous Master Suite at one end with the Main Bedroom boasting a tray ceiling and adjoining large open sitting area, ideal for either a relaxing TV nook or a computer center. The inviting Master Bath features an oversized shower, double vanity and large picture window overlooking the resort-like setting. The other end of the upper level features two bedrooms with a connecting Jack-and-Jill Bath and another separate Bedroom and a Hall Bath. All Bedrooms feature Plantation Shutters. A catwalk provides an open view of both the large foyer as well as the Family Room. A full finished basement consists of a large carpeted recreation area and tiled workout area which is ready for sports enth"
"Imagine coming home to this gorgeous 4 bed. 3.5 bath home nestled at the end of a cul-de-sac in Lower Gwynedd. For more than 25 years of excellent craftmanship, Rotelle Builders has delivered to many clients, and stood behind every detail of each home he builds. Introducing is the... Tisbury II CAN sit on your private 1.73 acre lot buffered by mature trees for privacy. This home offers a grand foyer surrounded by oak treads with painted pine risers when you enter, or perhaps enter from the mud room. Pick your upgrades as you travel to each room with cathedral ceilings but limited to some rooms having 9'high.ceilings. The gourment kitchen is a chefs delight with granite counters color choices, an inland centered for convenience, hardwood floors, stainless steel appliances. The breakfast area is adjacent to your kitchen with an option of a circle top window for extra beauty and light. Escape to the study to read or take in a movie in the family room surrounded by family. Entertaining for the holidays are steps away in the dining room and living room. The upper level greets you into your master suite . Swallow yourself in your jacuzzi while enjoying the ambiance of your surroundings. His and hers walk-in closets are not short of space. Three more large bedrooms on this level. Stepping down to the basement, being unfinished. The builder has left you with thoughts of how to bring this space to your liking. Customizing your dream home has endless possibilities. THIS BUILDER HAS MANY STYLES AND FLOOR PLANS TO ACCOMODATE THE CLIENTS NEEDS. Don't miss out on this opportunity for a summer delivery. Superior financial progams with land incl. *** Land can be purchased separately*** Buyers allowance of $19,000 for site improvements"
"Come see why PHILADELPHIA MAGAZINE recently chose to feaure this unique estate home! 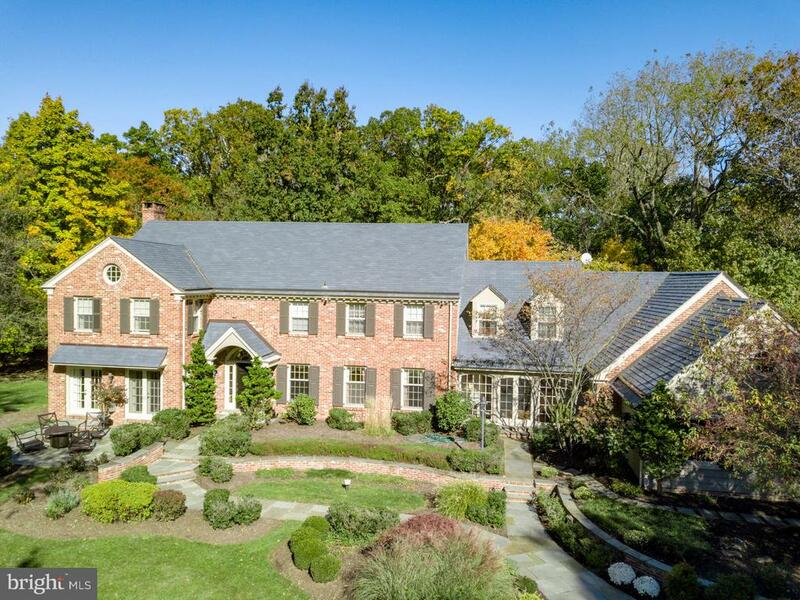 Located in prestigious Lower Gwynedd, this home also has a separate in-law-suite and gorgeous pool on the property. This stunning stone dutch colonial sits back from the road on 3.5 acres in Wissahickon School District and provides approximately 5,000 sq. ft. of living space, including the finished basement and in-law suite. This home has an entrance to dream about... Imagine the fun you'll have decorating the grand front porch and large stone columns for the holiday seasons! Upon entering the home you are greeted by gleaming wood parquet flooring, one of 4 fireplaces and an open layout great for entertaining. Character abounds everywhere you turn, through the window and floor moldings, to the grand stairways, and each intricate detail you will notice once inside. Enjoy a crackling fire while watching your favorite movie in the living room or while hosting intimate gatherings in the dining room. A large sunroom, kitchen with chef's oven, powder room, laundry area and mudroom complete the first floor. The second floor hosts 4 large bedrooms, one with a fireplace, and 2 fully renovated bathrooms. The third floor is reminiscent of your favorite bed and breakfast with a hallway gathering area, 3 additional bedrooms and a full bathroom with clawfoot tub, perfect for out of towns guests or an au-pair suite. Host large summer gatherings out back by the patio and expansive pool area with plenty of room to fit all of your guests! OR relax and enjoy your very own backyard retreat! Completely separate and private in-law-suite could also be used as a pool house or guest suite, has its own kitchen area, full bathroom and walk-in-closet. This home also comes with its own chicken cage, live chickens and an enormous 3 car garage with a second floor. Take a step back in time to when beauty, quality, and uniqueness mattered. Much of the restoration of this home has already been done with "
"Architecturally Striking - Welcome to this superb one of a kind custom built 4-5 bedroom with 3 full baths and 2 powder rooms and has approximately 5,000+ square feet - located on a peaceful cul de sac street surrounded by township open space. Greet your guests on the relaxing front porch where you can watch your children play on the expansive front lawn. When entering into the foyer you can view the amazing Lofty Great Room with a floor to ceiling stone fireplace, sparking hardwood floors, skylights, recessed lights, stereo speakers, and doors out to the oversized sunroom. A first floor master bedroom with an attached home office/sitting room/ nursery with glass doors is a great space. The main bedroom has two fitted walk in closets and a huge ceramic tile bath with jacuzzi, large walk in shower, his and her vanities, a toilet and bidet located in a private alcove & his and her vanities. The stunning formal D/R with h/w floors and huge picture window is a showstopper. The wrap around kitchen has granite counters, double ovens, customized built in Teak kitchen table easily fits 6 counter stools, a perfect spot to chat with your family while you are cooking, a huge walk in pantry closet, and an adjacent breakfast room which is open to the family room. The attractive F/R also has a stone fireplace, a surround sound system, hardwood floors. There are two other bedrooms with a Jack & Jill Bath on the main level, a powder room, laundry/mudroom, 2 car garage completes the first floor. The Second Floor has a large study room/bedroom which overlooks the great room, a large additional bedroom (guest room) with private bath. The finished basement a great space for the children to play, with a powder room. Two additional large storage rooms, one with a second laundry area. There is a central vacuum system, a huge sunroom with ceramic tile floors, a great spot for your pool table and for family fun. The backyard has a stone patio and extensive gardens. Other improv"
"Sitting on a large piece of serene property with a street name that fits it's past 1030 Farm Lane site waiting to be discovered by someone who enjoys old world craftsmanship, privacy and inside the elegance of 9' ceilings, original doors with intact hardware, casing with era moldings 9 inch baseboards. Random plank flooring on 2nd & 3rd floors, downstairs has 1 1.2 inch tonge and grove oak flooring. Rooms that have been updated with Tin Ceilings. All separate offices for private work spaces. Built in 1890 grounds have original outbuildings, garden islands first generation 90' tall red oaks. While enjoying your morning breakfast you will enjoy a scenic view of St. Mary's lake. Come see this undiscovered, undeveloped piece of history." "~A Home to Appreciate! You will love this sparkling 4-5 bedroom 4 1/2 bath bright and cheery colonial located in the popular Chestnut Creek Community - a very friendly community. Your family will be welcomed the minute they move in. This home has stunning curb appeal and once you enter the 2 story foyer you will see the impressive split staircase and view the cat walk which overlooks both the foyer and Great Room. This home has great charm with all the classic mill work t/o. The french glass door leads you to the private library, a perfect spot for your home office. The L/R and the Great room with a volume ceiling has a new gas burning fireplace, tons of windows and ceiling fan are great spots to relax and watch TV. The butler pantry leads you in to the formal dining room with dental molding. The expanded island kitchen is open to the Great Room and the Breakfast Room. The 42 cabinets, stunning granite counters with tile backsplash, double stainless steel sink, hardwood floors, two drawer Fisher Paykel dishwasher, and nice choice paint colors. The 8' island has a gas burning cooktop with downdraft. There is also a media area, for children to do homework while your family is preparing dinner and a pantry closet. There is a door out to an expanded deck where you can enjoy your morning coffee or BBQ with friends. The backyard has tons of open space with beautiful nature views. There is a powder room tucked away on the main level, laundry/mudroom, and back and front hall closet. On the second floor is a stunning main bedroom with coffered ceiling fan, recessed lights and good closet space. The new custom main bath is stunning with huge shower and ceramic tile, his and her vanities with granite counters, a jacuzzi bath, and linen closet. Large walk in closet with laundry chute. The finished walk out basement is amazing with playroom, media room/entertainment room, fitness area, cardroom, 5th bedroom, full bath, and door out to yard. The 2 car garage compl"